Second, transcendental arguments start with all or an aspect of experience. The argument proceeds from an experience (belief, laws of logic, intuition etc.) and inquires as to what the necessary condition for such experience is. Finally, transcendental arguments are often dialectical in nature: “they set out to show that something the skeptic takes for granted as a possibility... must be abandoned, as the one is in fact impossible without the other, for reasons he has overlooked.”5 This final factor supposedly leads the skeptic to affirm the state of affairs in question even when he denies it. For the metaphysical type of transcendental argument one challenge is significant. The criticism is made by Barry Stroud who argues that the skeptic can reply that given the conclusion of the transcendental argument, all that is really necessary is that one believes certain things that are preconditions for experience. In order to respond to such a challenge, says Stroud, the TA proponent would be required to verify such a metaphysical claim in a traditional manner through verifying through experience. Alternatively the TA proponent is forced into a transcendental idealism. Since Stroud's criticism it has become common to delineate between metaphysical and epistemological transcendental arguments.6 However, in the case of TAG it is unclear how one could be criticized for convincing someone to admit that they believe in God even while they say that that does not mean God actually exists! James Anderson notes the distinctive nature of Van Til's argument. First, the claim is that the very possibility of human thought has, as its necessary condition, the existence of God. That is to say that even if there had been no human thought, God remains the necessary condition for the possibility of human thought. Second, Anderson notes that Van Til's claim is that all, and not merely a part, of human thought has, as its necessary condition, the existence of God. This has led to proponents of TAG to begin with a variety of aspects of human thought. One might begin with questions of accounting for empirical observation, aesthetics, laws of logic or ethics. Conversely, TAGs are often mistakenly considered to be somehow invalid if the opponent remains unconvinced by them. However, just because an unbeliever is not convinced by an argument it does not make the argument invalid or unsound. Many arguments are valid and have true premises. If they fail to “work” to persuade an objector it is not necessarily because the argument fails on its own grounds. Human beings are resistant to many claims of Christianity proposed in many argumentative forms many of which are just as sound. Here again the Christian is quite aware of the reason a person might reject a sound argument for the existence of God - human sin. We might even say that Christian theism provides the necessary conditions by which we might explain why a rational person would reject a sound argument! The distinguishing mark here is that the dialectic between two systems of thought are person dependent. 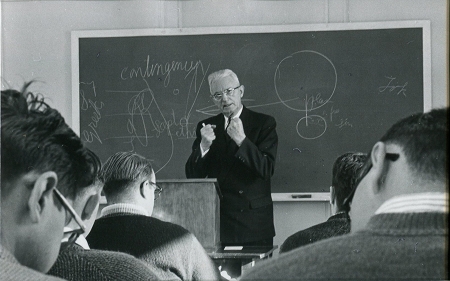 Van Til felt that an argument for the existence of God should seek to demonstrate that the Christian system reflects reality and is what makes the argument possible. It does this by arguing that the possibility of any system of thought held by a person must already presuppose the truth of Christian theism. In order to do this a believer actually has to have a conversation with an unbeliever. This makes articulating such an argument difficult outside an actual conversation between an unbeliever and a believer. Much analysis of TAG remains an analysis of particular debates and engagements between people. Proponents of TAG (at least of the Van Tilian type) largely shy away from providing examples in their literature. The reason is plain once one understands the project. Since worldviews are held by people and are systems in toto it is a disservice to the argument to abstract particular tenets of a worldview without a person. However, in order to see how TAG is used let us attempt to consider some examples. James Anderson outlines four of Van Til's arguments for the existence of God. Each one seeks to demonstrate the existence of God as the necessary precondition for human thought. The second claim is perhaps the most perplexing – in order for humans to know anything, God must know everything. Loosely stated, the problem is how one accounts for the unity of knowledge and the “notion that everything is related to everything else”18 without positing a comprehensive knowledge in either the human or in God. In practice the latter argument can be used in refuting de facto objections to theism. Atheism is a disbelief of any kind of divinity. However, to be certain that there is no god one would have to know comprehensively all that there is to know about the universe. Since no human can claim to have such knowledge, such a categorical statement is an overreach. One might, instead, be agnostic in the sense that one claims that it is not possible to know whether there is a god or not. In this case a universal negative has been asserted. To claim that it is not possible to know if there is a god is to say something very definite about reality. As Van Til notes, “agnosticism is epistemologically self-contradictory on its own assumptions because its claim to make no assertion about ultimate reality rests upon a most comprehensive assertion about ultimate reality.”23 The question is how one would know that it is not possible to know that there is a god. This question could not be answered without knowing exhaustively what is and what is not possible to know. This is not a sustainable position for the same reason as a categorical denial of God's existence is unsustainable. Although explicit agnosticism remains popular, another approach is to claim that, given the evidence we have, it is improbable that god exists. Richard Dawkins, who supports such a claim, refers to a “spectrum of theistic probability.” Consequently, he claims to be 6.9 out of seven sure that God does not exist.24 This latter claim is perhaps the most popular position of contemporary atheists, found mostly within the scientific community or among those who hold to a broadly empiricist epistemology. However, what is not clear is how one knows how much more there is to know about the universe. It might be that we are close to a comprehensive worldview including a naturalistic explanation for all phenomenon. But because we cannot know how much further we have to go we cannot be certain that it is a short distance to the end or if we have only just begun. Also, if a new piece of evidence emerges it could change what we already know about the universe forcing a review of what we have already taken to know.25 If it is even possible that the way we know (such as the inductive method) may turn out to be faulty, then our claim to know anything is in doubt. Another strategy Van Til suggested is to show how the challenge presented can only be answered if one assumes the possibility that God does not exist. To take a contemporary objector, William Rowe suggests that theism must meet a challenge related to creation. How, given God's omnipotence, omniscience and omnibenevolence, is it possible to conceive of a better possible world?26 Perhaps I have a broken leg in this world. It is conceivable that a world might have existed in which I do not have a broken leg (a better world by far for one with an addiction to running). Surely if there is a better possible world, such a supremely good and powerful God would be obliged to create it. Rowe suggests that, given such a possible world, it appears possible that God is not as good or powerful as supposed or a being is possible who is greater than God. How would a transcendental argument be useful in this case? Consider the notion of possibility. We might ask what it is that makes possibility possible. The question of the possibility of a world that is better than this one ruling out the possibility of God (as defined by Rowe) assumes that possibility is possible without God. But if God is the source of all possibility, then the god-less possibility is not possible at all. So, the question of whether it was possible for God to create another possible world has no meaning unless it is assumed that possibility is possible without God. If there is such a possibility, then God is not God. If, on the other hand, there is no such possibility then the question is answered before it is put.27 This argument is illustrative of how transcendental arguments attempt to reveal how the very terms of the debate (in this case the nature of possibilia) are only possible on one worldview. A final example is worth noting since it is perhaps the most common transcendental argument. Schaeffer provides a good example of the moral argument stated in TAG format. The argument is as follows: There is a sufficient basis for morals. Nobody has ever discovered a way of having real “morals” without a moral absolute (the sufficient basis for morals). If there are no absolutes, there can be no morals. There are morals. Therefore, the God of the Bible (the sufficient basis for morals) is there.28 Schaeffer distinguishes between the existence of moral absolutes and the ability to know morals. The question is what would have to be the case for human beings to know what morality is? In the above arguments God's existence is given as the necessary condition for particular human experiences. More strongly, they state an assumption, linked to human experience, and proceed to demonstrate that Christian theism must be true in order to account for human experience. If successful, arguments such as these can produce the result of forcing the unbeliever to deny a premise only on the pain of sacrificing rationality. One can only deny morals on pain of irrationality, rationality being assumed in the denial. The arguments are also not probabilistic. They deny any possible alternative and lead to a necessary conclusion. As such they are not arguments to the best conclusion, but to the necessary condition. However, if we look again at Bahnsen's claim, it is clear that he does not imply that he, or any other human being, must have comprehensive knowledge of the universe in order to justify logic, the uniformity of nature or any other universal claim. What he does say is that someone must have that comprehensive knowledge, and that someone is God. According to Bahnsen, the truth of Christian theism is the necessary condition for the uniformity of nature. Choi's objection appears to imply that Bahnsen is offering a proof that it is inconceivable to doubt. If that was what Bahnsen was attempting to do, then he would fail. However, it seems clear that Bahnsen's argument with Stein is that Stein's worldview cannot provide the necessary conditions for human knowledge of the uniformity of nature whereas Christian theism can. A further rejection is leveled at the proponent of TAG. Since, the argument attempts to argue that God is the necessary precondition for human thought or experience it appears that the proponent of TAG would have to know exhaustively all alternative worldviews. It is possible, so the objection goes, to conceive of such a worldview that meets the demands posed – an account for rationality, ethics etc. Choi presents the “Fristianity” challenge as an example of this kind of challenge to the proponent of TAG. Choi asks us to “consider Fristianity, which is a theistic worldview that holds to the doctrine of the quadrinity (one God in four persons) and is otherwise identical to Christianity, or as similar to Christianity as possible (given its quadrinitarian tenet).”32 Choi admits that Fristianity is not an actual worldview, but suggests that one only has to establish the possibility of another worldview that can meet the demands for a necessary condition for rationality in order for TAG to be rendered unnecessary. The first thing to be said is that if Fristianity is “otherwise identical to Christianity” then Fristianity holds to the doctrine of inspiration, the basis of which is the claim the Bible makes to be inspired. If such a fourth member of the Trinity is to be added, it is incumbent upon the Fristian to show, from the Christian Bible, how such a doctrine is to be supported. In Michael Butler's response to the Fristianity challenge,33 Butler mistakenly argues that for Fristianity to be identical to Christianity, Fristianity would need its own set of revealed texts. Choi responds appropriately by saying that Fristianity has no need to postulate its own “mysterious revelation.” However, since Choi defines Fristianity as “identical to Christianity, or as similar to Christianity as possible (given its quadrinitarian tenet)” it should be open for the proponent of TAG to say that in order to be identical to Christianity it must depend for the knowledge of God upon the divinely inspired Christian Bible as we know it. The argument over a fourth member of the Trinity is an argument of how one interprets the scriptures as we have them not the postulation of an alternative scripture and how we would interpret that. Choi's response to Butler is that Fristianity has not been revealed but “stipulated.” In other words, whereas Christianity, in the actual world, has been revealed to human beings by God, Fristianity, in a possible world, has been defined as a possible worldview in a debate over the strength of TAG. Since, a possible worldview (such as Fristianity) can be postulated as the necessary precondition for human experience, then TAG can no longer claim to provide the necessary preconditions for human experience. The root of the problem is whether a necessary precondition originates in the mind of the human (Fristianity) or in the mind of God. A thought experiment of the kind used to postulate a possible worldview which meets the demands of being a precondition for human thought amounts to saying that there might be a worldview which meets the demand, but that we do not yet know of it. If this is admitted, the objection fails to establish why since the Christian worldview does account for logic and the uniformity of nature and already exists one is obligated to hold out for another worldview that does the same thing. Of course, the reason anyone holds out for an alternative worldview is not that something better might come up, but because of human rebellion. This last point again illustrates a transcendental argument. It answers the question of human sin, giving the necessary conditions for the possibility of conceiving of human sinfulness. In my opinion, this personal contact and dialectical conversation means that the debate is not the presentation of argument and counter argument with a tallying of likely winner at the conclusion. Instead the transcendental argument allows you to go back and forth from worldview to worldview in a continuous stream of one argument. In other words, TAG continues both in the presentation of the Biblical worldview and in the presentation of the unbelieving worldview. In both cases the same question is asked: what is the necessary condition for the possibility of human experience? 1Van Til is notoriously difficult to read as his training in philosophy took place in an environment of British idealism. Anderson offers a contemporary version of the argument in analytic terms. 2A.C. Grayling, “Transcendental Arguments,” in A Companion to Epistemology, ed. Jonathan Dancy, Erenst Sosa, Matthias Steup (Chichester: John Wiley & Sons, 2010), 768-771. 3Robert Stern, “Introduction” in Transcendental Arguments: Problems and Prospects, ed. Robert Stern (New York: Oxford University Press, 1999), 3. One can recognize this as a reformulation of Descartes' cogito ergo sum. Descartes reformulated it along these lines: “When we apprehend that we are thinking things, this is the first notion which is not drawn from any syllogism; and when one says, I think, hence I am, or I exist, he does not conclude his existence from his thought as by a force of some syllogism, he must beforehand have known this major, All that which thinks is or exists.” Quoted from Descartes' response to Gassendi's objection in publisher's preface to Rene Descartes, The Meditations and Selections from the Principles of Rene Descartes (La Salle: Open Court Publishing Company, 1950), v. Van Tillians often joke that Van Til's version of the cogito is “I think therefore I AM” (Exodus 3:14). 4This is exemplified in Peter Strawson's argument for the existence of other minds: Peter Strawson, Individuals (London: Methuen & Co Ltd, 1959). 6For example, “Transcendental Arguments,” 770. 7Cornelius Van Til, The Defense of the Faith (Phillipsburg: Presbyterian and Reformed Publishing Company, 2008), . 10The Westminster Confession of Faith, I. 4-6. 11This is not to imply that TAG cannot function to stimulate confidence in Christian beliefs. That is also true of many other arguments for the existence of God. 15James Gould, ed., Classic Philosophical Questions (Columbus: Merrill Publishing Company, 1989), 350-560. 16“If Knowledge Then God,” 63. 17The caveat of “in principle” is to indicate that in practice people fail to live in accordance with their principles. David Hume remained reticent to cross the street without looking both ways even while he wrote of his skepticism of inductive knowledge. 18“If Knowledge Then God,” 64. 19Cornelius Van Til, A Survey of Christian Epistemology (Phillipsburg: Presbyterian and Reformed Publising Company, 1932), 214. 20“If Knowledge then God,” 65. 22The Defense of the Faith, 65. 23A Survey of Christian Epistemology, 213. 24John Bingham, “Richard Dawkins: '6.9 out of Seven' Sure That God Does Not Exist,” Telegraph.co.uk. Telegraph Media Group Limited, 23 Feb. 2012. Web. 1 May 2012. 25Cf. Thomas Kuhn, The Structure of Scientific Revolutions (Chicago: The University of Chicago Press, 1962). 26William Rowe, Can God be Free? (New York: Oxford University Press, 2004). 27Cornelius Van Til, An Introduction to Systematic Theology (Phillipsburg: Presbyterian and Reformed Publishing Company, 1974), 396. 28Francis Schaeffer, Francis A. Schaeffer Trilogy (Leicester: Inter-Varsity Press, 1990), 117. 29William Halverson, A Concise Introduction to Philosophy (New York: McGraw-Hill Inc., 1981), 75. 30Quoted in Sean Choi, “The Transcendental Argument,” in Reasons for Faith (Wheaton: Crossway, 2007), 241, ftn. 22. 33Michael Butler, “The Transcendental Argument for God's existence” quoted in Choi “The Transcendental Argument,” 245. 34Francis A. Schaeffer Trilogy, 117.